Our daily act of collective worship in school fulfils legal requirements and is planned to create a setting which encourages reflection and personal worship. We have a weekly theme which is linked to learning in other areas of the curriculum and encourages children to relate Christian teaching to everyday life and learning in school. Whole school worship takes place twice during the week with a member of the clergy leading one of those sessions and the Head or Deputy leading the other. Key Stage worship takes place once each week when children worship in a smaller group and is led by the Key Stage Manager. Class worship is held once during the week and class teachers share this worship time with their own children. Celebration worship takes place on a Friday afternoon. On special occasions and at regular times during the year services take place at Christ Church when we invite our whole school community, children, staff parents and governors to worship together. Parents have the right to withdraw their child from any act of worship, although this would be unusual in a Church school such as ours. Half Termly Theme: Community- Where is God in our community? On Monday 25th March, we were delighted to welcome Sue and Cath from Bible Eggsplorers, who came to deliver Easter workshops to each class in school. They launched the day with a special 'Pass the egg' worship, which retold the Easter Story and helped the children to understand the significant events and the order in which they took place. Well done to our KS2 children for finishing the term beautifully. The carol service was wonderful and the children did us proud. Many thanks for your generous donations in the collection at the end. We raised £126 for the burns unit at Wythenshawe hospital – a cause very close to a KS2 family’s heart. It was wonderful to watch the Infant nativity in church this year The children were fantastic in both of the performances. It was also great to see so many parents/carers and grandparents in the church. I am sure you were all so proud! All the hard work definitely paid off. On Friday 30th November we had a very special worship to introduce Advent. Rev. Saunders told the children about the history of Christmas and read the bible story about Elizabeth and Zechariah (Luke 1:5-25) Adam explained to the children about the advent candles, why they are all different colours and what each one represents. It was a wonderful start to this exciting time of year and gave us the opportunity to reflect on the true meaning of Christmas. On Friday 5th October, we had an amazing Harvest Service in church. It was lovely to see, so many people filling the building. A big thank-you to all of the children, parents and carers for the gifts of food and money that you donated. We are sure the foodbank will really appreciate it. On Thursday 29th March, we held our annual Easter Service in Church. Each class helped to recount the key events of Holy week leading up to Easter day. The service began with our Key Stage 1 children retelling the story of Palm Sunday, Year 4 then retold the story of Maundy Thursday and the Last Supper, Year 5 and 6 then read some very emotive pieces of writing that they had written around the events of Good Friday and then Year 3 finished off with their Easter Sunday acrostic poems. The service was completely delivered by the children and supported by the PAIS team who have been coming into school weekly to work with our Year 3 children. The atmosphere in church was lovely and at times extremely moving. Everyone went home with a smile on their face when they were given colourful Jelly beans as they left church to help them to remember the significance of the different colours within the Easter story. 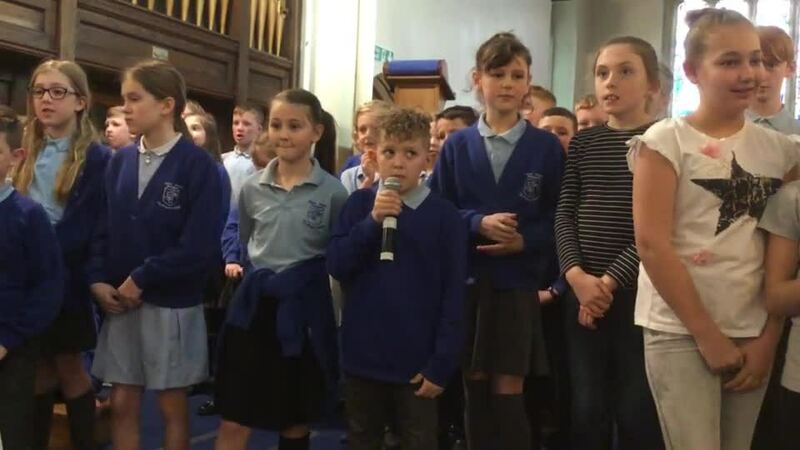 I don’t think there was a dry eye in the house on Friday morning when Year 6 and their Reception buddies performed a worship for their mums. They each explained why they loved their mum so clearly and bravely. Thank you to Mrs Baines and Mrs Hayden who prepared the refreshments for us afterwards. On Thursday 1st February the children performed two wonderful iSingPOP concerts. They were absolutely amazing and we were so proud of them all. To see the whole school singing their hearts out in praise was very moving indeed and brought a tear to many eyes! An enormous thank you to Jess Cook our iSingPOP tutor and to the PCC from Christ Church who provided half of the funding for the project. We can now add the new songs to our repertoire for worship and you can sing at home to our very own CDs. On Wednesday 17th January 2018, Rev Saunders came into school to talk to the children about the Old Testament Hero, Moses. The children were all captivated as Rev Saunders dramatically told the story of Moses, from him being found in the bullrushes as a baby to becoming a great leader and setting his people free. Well done to all the children in KS2 who created the most beautiful poppy for Remembrance Day - it looked just amazing! A big thank you to Rev Saunders who made an impromptu visit, with his trumpet, to play the last post. It was a very moving mark of respect. Thank you for all your Harvest contributions. We were staggered at your generosity and the Food Bank are so grateful for your donations. Additionally we will be sending £70 out to Uganda to the AYF band who visited us in January to help them spread the word of God. During our harvest service Reverend messaged members of the band and they sent a message of thanks to you all. During the week leading up to Easter, each of our classes helped to retell the Easter story by leading one of our daily worship times. Reception started us off on Monday by retelling the story of 'Palm Sunday', followed by Year 1 & 2 retelling the story of 'The Last Supper' on Tuesday. Year 3 & 4 then told a very moving version of the story of 'Jesus' arrest and death' on Wednesday, followed by Y5 & 6 finishing off the week, retelling the story of 'Jesus rising from the dead' in Church on Thursday. All the children did a brilliant job and really helped to bring the Easter story to life in school.. Thank you to all the parents/carers that attended this years Easter Service in church. It was lovely to see Reverend Butterworth being presented with his leaving gifts. The children were a real credit to the school and even our chicks made an appearance! AN ENORMOUS THANK YOU to everyone involved in this year’s Christmas Celebration in church on Thursday 10th December. Thank you to all the school staff for all their hard work in preparing and supporting the children and to families and friends for coming to join us! The children led a beautiful Thanksgiving Service for Mrs Lythgoe in Church on Tuesday evening. It was lovely to see so many former pupils and staff who had come along to share the evening with her. Thank you to all those who gave donations towards a leaving gift which was presented during the Easter Worship in church on Maunday Thursday morning. We all wish Mrs Lythgoe a very happy retirement but she will always be welcome in school.